Biggerplate Unplugged returned for 2015 earlier this month, and our very own Jamie MacDonald was in attendance, flying the flag for MindGenius in London. We were once again among a great bunch of experienced and knowledgeable friends from the mind mapping community, with a few friendly MindGenius user faces in the crowd! For his speech at the conference, Jamie decided to discuss some of the barriers that prevent individuals and teams being effective contributors in day-to-day working environments. In a business mind mapping software perspective, Jamie demonstrated how mind mapping software, such as MindGenius acts as a catalyst for more effective and productive way of working. Until next time – thanks Biggerplate! Countless books and articles have been written on Strategy, Strategic Thinking, Strategic Planning and other associated topics on Strategy. 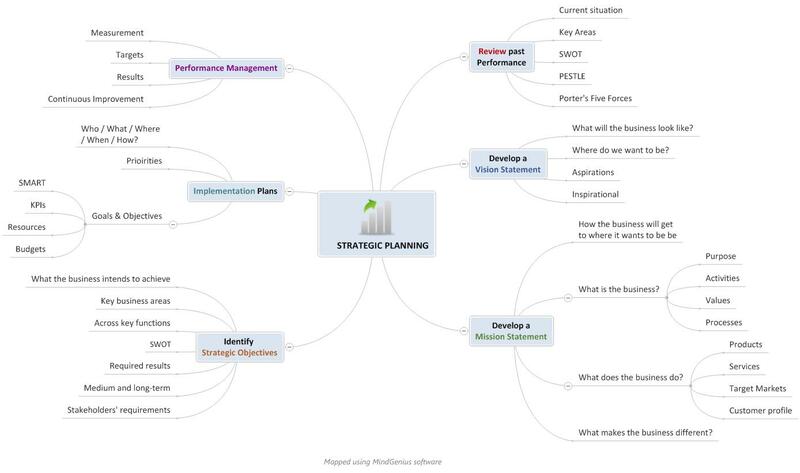 This short article provides a synopsis of the important area of Strategic Planning. Its aim is to act as a useful step-by-step guide to help with the sometimes complex aspect of business planning. · Perspective – vision and direction. Harvard Business School Professor Michael Porter argues that competitive strategy is “about being different”. He comments: “It means deliberately choosing a different set of activities to deliver a unique mix of value”. In one of his early books Porter defines competitive strategy as “a combination of the ends (goals) for which the firm is striving and the means (policies) by which it is seeking to get there”. 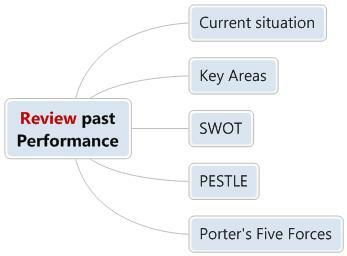 This is an important facet of kick-starting any strategic review or plan and provides meaningful insights into both positive and negative aspects of previous and/or current performance. There are many ways of doing this, including tools and techniques such as SWOT analysis, etc, but it is important to execute this part of the involving the right people (for credible and accurate insights and for decision-making and direction setting as the exercise progresses). A Vision Statement should be both an aspirational and inspirational description of where the business is going and what it aims to achieve in the medium to long-term. It serves as a clear guide for the direction the business wishes to take, setting out the high level primary goals. A Mission Statement outlines the core purpose of a business and its reason for existing. It should help guide the business strategies, articulate its overall goals, provide a roadmap and guide any decision making. A Mission Statement should also clearly outline products and services, which markets will be served and how; and communicate intended direction to the organisation, customers, and stakeholders. At this stage, the aim is to develop a set of high-level Objectives for all areas of the business. They need to highlight the priorities, goals and objectives that will ensure delivery of the vision and mission. 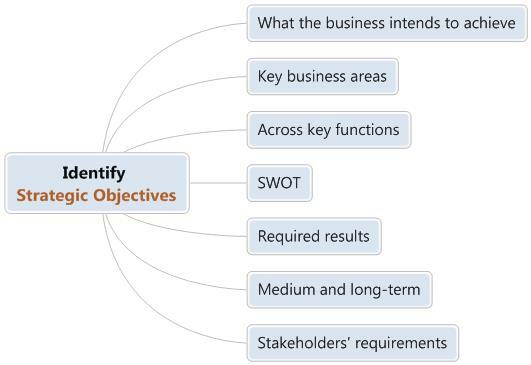 A view of the end-objectives and results required for each objective is a must. Aligned with the first stage of Review, in particular the SWOT analysis, other key aspects of setting these objectives would be: building on the identified strengths; ensuring plans and actions are in place to take care of areas of weakness; identified opportunities are factored in and included; actions are in place to counter any perceived threats. The distillation from the Vision, Mission and higher-level Strategic Objectives needs to filter down to Departmental, Team and individual Objectives and Action Plans. The “who, what, where, when, and how” needs to be agreed and communicated. Plans are now more “operational” and “process” aligned with SMART (specific, measurable, achievable, realistic and time-related) objectives agreed and put in place. These objectives also need to take into account Performance Indicators, Resource allocation and budget requirements. All the Objectives and Action Plans need to be continually reviewed against the agreed outcomes or Key Performance Indicators (KPIs). Targets and results need be continually monitored and reviewed. The whole Strategy and related objectives, plans, projects, etc, must be managed in such a way that strengths and weaknesses can be quickly and easily identified and acted on, with the ethos of continuous improvement and business excellence at the core of the strategy. • Creatively applying problem solving and other tools and techniques such as SWOT, etc. 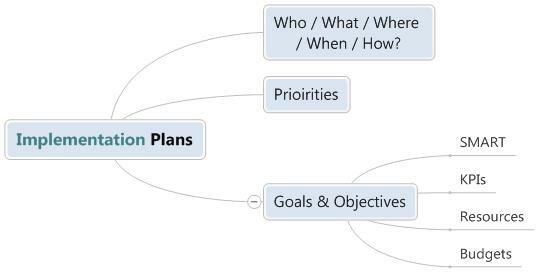 For those of you engaged in any of the Strategic Planning process, from the initial performance review, through to implementing and managing objectives, actions, projects, etc., I would thoroughly recommend the use of mind mapping software. It truly does augment and add value to your existing suite of daily-use applications through its highly intuitive and engaging “capture – visualize – manage” processes and functions, enabling increased productivity, clarity on all work activities and higher quality outputs (to name but a few!). "If like me you struggle getting started writing, anything, and find yourself staring at a blank screen and the cursor flashing saying “come on type something for goodness sake". A technique that I use, just as I am using now, is to start writing just what’s in my head without thinking about sentence structure or choice of words. Another great technique is using MindGenius. It’s a way of pulling together information that I think I might need to work into my piece of writing at some point. To facilitate this I construct a MindGenius map. In this case I’m writing a research paper and to help you get started on your own paper, I’ve turned my efforts into a template. The really useful thing about this template is you don’t have to be thinking in terms of a beginning, middle and end, or, in this case, Introduction, Results and Discussion, before you can write. Basically we’re talking about a means to get around the so-called “Writers block”. Just to get going, copy and paste the tile and authors of possible relevant publications into the Introduction arm as separate branches, add a sub-branch and paste in the abstract if you want. Copy and paste from the pdf, or write in sentences or small sections, from the text of these papers into the branches where you think a comment in your own words may be required. Alternatively, you may like to just quietly sit and think, “why am I writing this paper?”, “who is it for?” and as you come up with some thoughts put them into the Purpose branch. Start in your mind to build logically how your idea can be described. 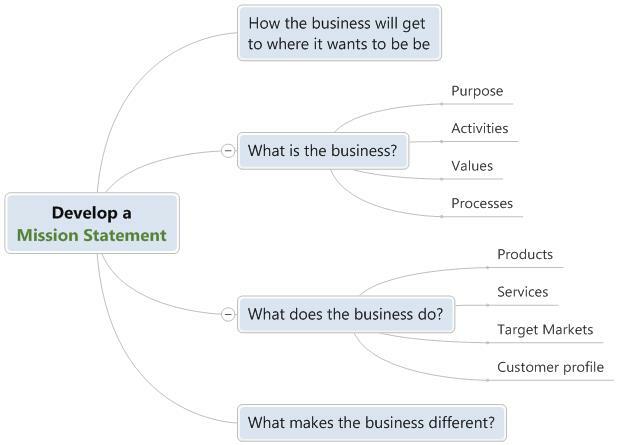 Start laying out this logic by writing your thoughts as Results branches. As you do this, have in your mind to create a Hook, something about your research that will grab people’s attention. Place this hook right at the beginning of the Introduction. Our goal is to communicate your idea. Communication skills were not taught to scientists when I was at third level education. Thinking about the best way to communicate and what I’m hearing these days is simple. We learned to read and learned about life through people telling us stories. Why not tell your idea as a story? The Introduction sets the scene for your story. A journey is travelled and Results collected on the way. Our finale is the Discussion showing how it all comes together and wouldn’t it be good to have a bit of a cliff-hanger to have your readers wanting more. Give credit where credit’s due. Inspiration for my template came from a lecture by Professor Simon Peyton Jones, University of Cambridge. There will be key aspects of your work that has come from other researches. Don’t just acknowledge these contributions but show how they are important to you and where they fit in. Use the template to structure these references. Doing this will bring focus to your work, clarify your thinking and show you do actually know what you’re talking about. Once you’ve got your background information and the results sections to support your idea on the template, drag, copy/paste the information to re-organise what you have into a coherent story. Add/delete branches as you see fit. My most recent effort started with 3 Results branches, expanded to 6 and then ended up at 4. Two of the branches marked as “next paper”. Yes, only include what has merit in supporting your idea and don’t use up precious column space just because you think people want to see you’ve done loads of work. They don’t and it doesn’t matter. You should now have a good feel for what you want to say, so just start writing whatever section or parts feels most comfortable. Update the template as you write. Highlight in colour parts that are completed, needs revisiting (but move on and come back later), “requires more data”, and so on. Honestly, it does get easier as you keep writing and you’ll find your own rhythm or flow. When you get to a satisfactory draft of your paper, dispense with any fears and get somebody to read it through and appreciate the feedback."